Click HERE to buy tickets for our upcoming concert! 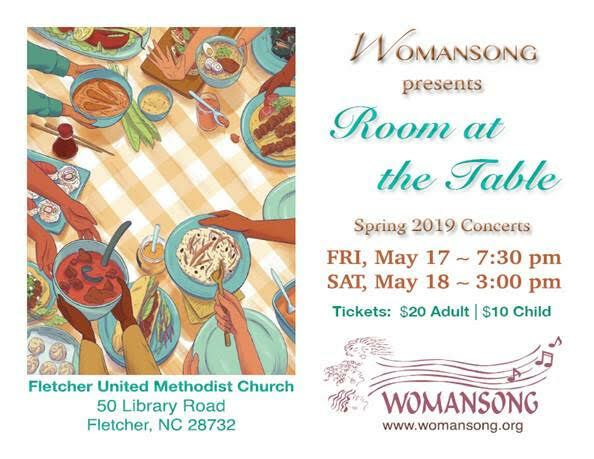 We invite you to Womansong’s spring concert! The theme comes from Carrie Newcomer’s uplifting song of inclusion: “No matter who you are, no matter where you’re from, there is room at the table for everyone.” The concert features audience favorites from Womansong’s repertoire and a powerful new song by our own Lytingale that was inspired by the Me Too movement. Songs span a variety of genres from swing to contemporary pop to a classic Holly Near anthem. There’s something for everyone -- music to make you laugh, cry, dance, and of course, sing along. Directed by Althea Gonzalez, Womansong is a 75-member chorus that celebrates the unity, diversity, and empowerment of women through musical expression. Our concerts help fund the operation of our nonprofit organization including the choir’s New Start Program, which provides scholarships and emergency funds to local women in need. Womansong concerts are accessible to the hearing impaired through music sign language interpretation by Shiner Antiorio.